Easy-Life ffm works in both salt and fresh water by improving and stabilising water quality, removing chemicals, medicine residue, chlorine, heavy metals, ammonium and many other contaminants, improves plant growth, young fry grow better, promotes coral growth, algae removal and prevention, destresses fish, neutralizes harmful bacteria, promotes breeding and much more. 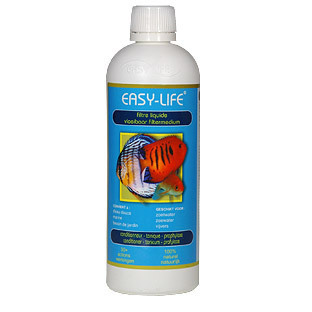 Easy-Life ffm prevents unnecessary suffering and dying of freshwater and marine animals during transport and quarantine, after a medical treatment, in case of injuries and bacterial infections, calamities like power failure and so on. Easy-Life fluid filter medium produces over 30 different effects, without showing any detrimental side-effects.